How accurate are the calorie counters on the cardio machines (treadmills, ellipticals, bikes, rowers, etc.) that you use at the gym and at home? Not very, it turns out. Numerous studies have shown that calorie counters on cardio machines are overstated. For example, one University of California, San Francisco experiment conducted for Good Morning America, found that elliptical machines were the most optimistic, overestimating one exerciser’s calorie expenditures by 42 percent. Meanwhile, treadmills overestimated by 13 percent, stair climbers by 12 percent, and stationary bikes by seven percent. Another issue to consider is the age of the equipment. Newer machines tend to be more accurate; older machines, less so. Caloric expenditure varies based on gender, age, weight and fitness level — which includes aerobic capacity, metabolism and ratio of muscle to fat (more muscular bodies burn more fat). Most cardio machines allow you to enter the first three variables — your gender, age and weight — so make sure to do it. That will give you a much more accurate portrayal of calories burned. We burn fewer calories as we age, and men generally burn more calories than women. 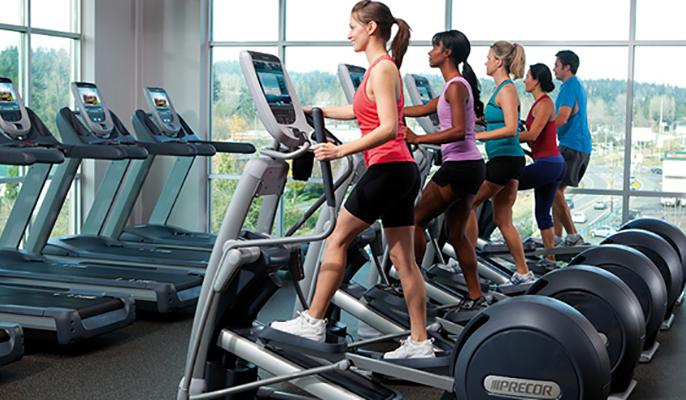 Many treadmills use a reference weight of about 155 pounds. If you don’t weigh 155 pounds, the reading at the end of your workout is not accurate. Enter your true weight. Heavier bodies burn more calories in any given workout. Additionally, relying on the handrails—especially during higher inclines or while running at high speeds—can throw off your reading by as much as 40 percent. Avoid the handrails. When you walk outside, there aren’t any. Your heart rate will also determine how many calories you burn, so make sure the machine can synch to your heart monitor, assuming you have one. When it comes to burning calories, the greater your exertion, the greater the rate at which calories are burned. Working out at 60% to 75% of your maximum heart rate burns fewer calories than working out at 75% to 85% of your maximum heart rate. As always, get in Motion; stay in Motion.